A police officer dubbed "Superman" when he held on to a crashed van hanging over a motorway bridge has praised the "incredible" bravery of the driver. PC Willis said: "I was so frightened it was going to go over the edge the way it was rocking." PC Willis said: "The driver was incredibly brave he kept still while suffering from severe injuries. "It must have been terrifying for him as well. It was really, really scary but it is what we do." PC Adam Pace‏ tweeted after the incident "Your superman cape isn't in this photo though! Must have come off in the fracas!" 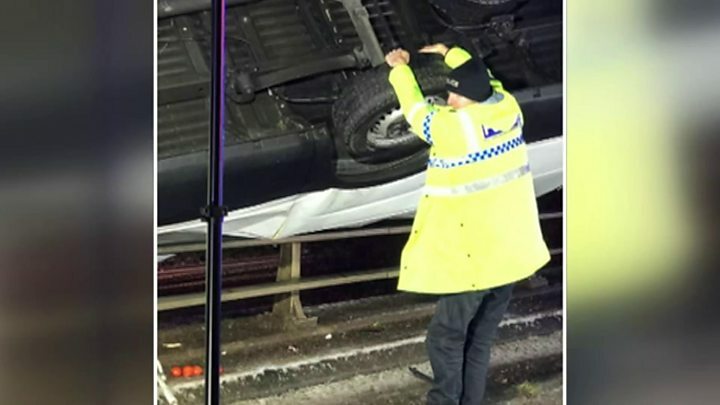 Image caption PC Willis said when lorries went past the crash the van was "swaying"
PC Willis, a roads policing officer with West Yorkshire Police, based in Bradford said he was on the way to a different crash when he saw the van "upside down on top of the bridge". "I just knew I had to stop at this one, it was a very serious collision," he said. He heard the driver respond to his shouts and through the wreckage he "could see his leg was badly broken". PC Willis said he thought "any moment now this vehicle could literally tip over" then the van driver and others on the road beneath could have died. "It felt longer than that", he said about the 15 minutes. He has been "overwhelmed by the public response" but said "thousands of emergency workers do it in a day." His back was "a little sore", he added.